The English O Level, 16+ or C grade GCSE have always been coveted qualifications. Pressure has never been greater to achieve them. The English GCSE show was the first show written, based on the content of intense revision sessions and the input of several course leaders. 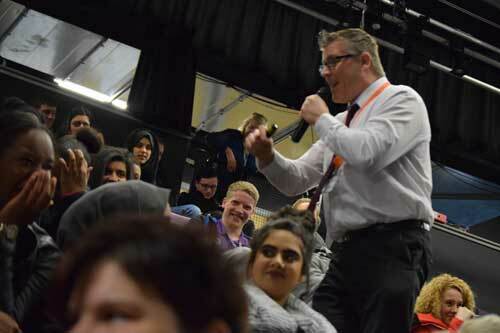 The idea behind the show is to offer an alternative voice to give the key messages that pupils need to hear and to deliver them in a memorable and different way. The show makes use of comedy and songs and ensures the session is an engaging learning experience. If the pupils remember the show and songs, they’ll then remember the skills the were learning, and apply them. The show comes with access to lots of free resources including a workbook and copies of all of the songs for use in class. Even the most challenging year 11s were absorbed in the session. As a school we had our best ever results, we were 13th in the Daily Telegraph’s top 30 state schools and got 88% A*-C for 5 inc English and Maths We will want a repeat booking. Thank you very much for travelling all the way over to us - it was a great show and the kids took a lot away from it. The year 10's in particular have been caught humming the odd tune in the corridors!